Many thanks of the opportunity to respond to the Bloodlines Draft EIR. After Mr. Phinney's initial presentation of the project to neighbors, I was impressed with the stated commitment to conservation easements, worker van-pooling, urban tasting rooms, a winery in Vallejo, alternative marketing and branding techniques, a​ desire to reach out to residents and to develop a charitable purpose to the business model - all which point to an approach that is looking for success that is sustainable and beneficial with a minimal impact to the agricultural land and open space that is our home. I was interested to see the map in the EIR showing the ECP's within a 3 mile radius of the project. Most all of the purple blocks within the Rector Watershed, and more, have been created around us since we moved here in 1993. It was the undeveloped remoteness of this place that made it a desirable place to be. That remoteness shrank one block at a time over the years, and, as the vineyards replaced the chaparral (and some woodlands), we took it as one beautiful landscape replacing another with the small comfort of knowing that vineyards are better than housing tracts. The first is traffic. As traffic reports invariably show, the additional traffic will always be less than significant, and an additional 6-12 cars a day may indeed be insignificant. But the traffic begins to add up, and we now can have a caravan of 50 or 60 cars on the one lane gravel road which then speeds down the paved road. My request to you is to make a good faith effort to reduce the traffic by beginning to talk to the other growers on the plateau with the aim of creating some sort of van-pooling arrangement. I'm not sure that one van is better than several cars in terms of damage to the roads or the danger to residents driving on the road, but the County is looking for ways to reduce vehicle miles travelled, and worker transport is one solution often discussed. The confined dead end destination of the Rector plateau seems like one place where van-pooling might be successful. I can only guess that the major vineyard operators on the Rector watershed occasionally get together to talk over common interests and that this is a subject that might be brought up. Even if Bloodlines had a van for its 12 workers, it might show the viability of the concept to others. I recognize that it might also require some commitment on the part of the county to insure that there are parking lots that the vans can work out of. The second concern is the development that may take place after the vineyards are in. The Mountain Peak project has brought home to all of us living here that the County's definition of agriculture allows for the construction of public entertainment venues in what are residential farm communities. Such commercial development is an immediate degradation in the rural quality of life that most residents have sought out in living here, particularly on such a remote dead end road. Again, I was impressed by Mr. Phinney's commitment, in his presentation to the community, to process grapes and to retain marketing activities in Vallejo. But Mr. Phinney may not always be the owner of the land, and this is an opportunity to insure that future owners are as committed to protecting the rural and natural character of Napa County as he is. In the EIR a commendable commitment has been made to an 8.2 acre conservation easement. But with 103 gross acres of vineyard development on the 287  acres of property, there remains 176 acres of land that can be developed. It is, of course, a big ask, but one that I feel should be made in the context of this application: Could the owner not place the entire extent of the property into a conservation easement, one that would allow vineyard development where appropriate, but would prevent the development of future building projects that would further urbanize the Rector plateau? 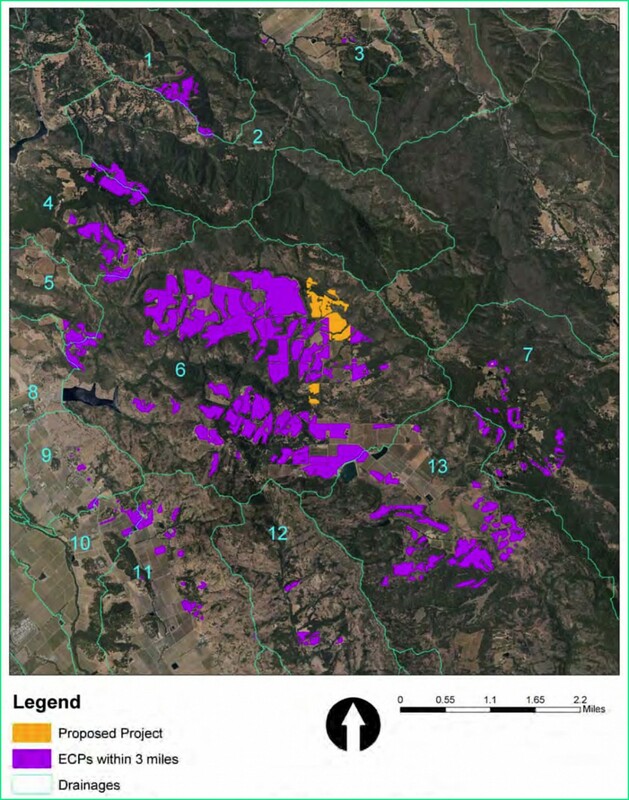 If I'm not mistaken, the northern properties abut the Sutro Ranc, and the ridge above the Bloodline vineyards would be a significant addition to the Land Trust holdings. Protecting this area from further urbanization is the greatest mitigation that could be given to neighbors and to the county as a whole in its effort to maintain Napa County as a rural enclave into the future. Again thank you for the opportunity to comment.